Last month my wife and I visited a Catholic religious store, looking for something to give one of our children as a present for a baptismal anniversary. We found something suitable -- a lovely pewter cross featuring a medallion in the center showing the image of our child's name saint. The image quality may not be easy for all eyes to make out, but surrounding the image of Pope Francis is this inscription: "Pope Francis, pray for us." It should not be necessary to explain why this is completely and utterly un-Catholic -- in fact, a grievous offense against all piety and devotion. We Christians pray for each other every day, and every day one will hear some Christian asking another, "Please pray for me," or groups of Christians asking, "Would you please pray for us." We also invoke the saints and angels with the words, "Ora pro nobis." "Pray for us." We carry blessed sacramentals and devotional images dedicated to heavenly saints and angels as a means of invoking their intercessory patronage. It is only right that we should accord such honor to the members of the Church Triumphant. Whom God has greatly honored we also must greatly honor. But we do not make sacramental, devotional images and articles dedicated to any of our fellow Christians whom the mortal flesh still detains in this life. No matter how holy he or she might be. No matter how impressive he or she is to us. No matter how much authority he has in the Church. Not even of the Pope. To accord to anyone here below -- even the Pope -- the honors and accoutrements of a formal sainthood cult is to give him much greater honor than God gives him, and is therefore functionally and effectively, if not literally, a kind of idolatry. After death, if Heaven confirms his sanctity, comes the sainthood cult -- not until then. To do otherwise would scandalize the faithful and put the one so honored at grave risk of sinful pride. 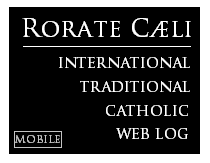 Catholics love and honor and respect and obey the Pope, and accept that under certain strictly defined conditions his teachings are infallible. We pray for him constantly and especially. However, among the many disorders of the modern Church is excessive, inordinate respect or adulation for the person of the Roman Pontiff. Examples of improper respect for the Pope in various quarters came to be particularly evident during the pontificate of St. John Paul II, whom many seemed to idolize as if he were a rock star or some other kind of celebrity. 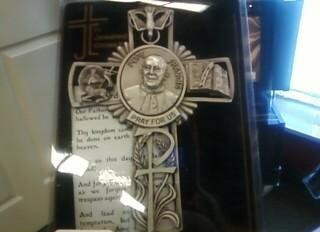 There were probably even some illicit sacramentals that honored John Paul II just as the above pewter cross illicitly honors Pope Francis, though I personally don't remember any. "Whoever wants to discover what Jesus wants from him, he must ask the Pope, this Pope, not the one who came before him, or the one who came before that. This present Pope." On the contrary, it is to the Scriptures, the Apostolic Tradition, the unanimous consent of the Fathers, and the constant Magisterium of the Church over the course of the entire past two millennia to which we must turn to discover what Jesus wants of us as a Church and individually. A pope's magisterium is only valuable and edifying to the extent that it conforms to and confirms the Faith of the Church. 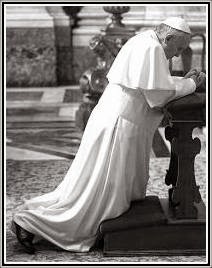 The Church was not founded in 2013, and Pope Francis is merely the Vicar of Christ, not Christ Himself, nor will it be refounded when the pontificate of Jorge Bergoglio ends in the near future. Let us love and pray for the Pope. But let us never give to him greater honor than Jesus gives him. And if you own one of those pewter Pope Francis crosses or anything like it, throw it away. Pray for the Pope. Don't pray to him.